Because of their enduring character and continual use, those buildings of Late Antique Rome that are most likely to have survived the Middle Ages and Renaissance are the churches and things turned into churches, like mausolea or the Roman Curia. But the Late Antique world is not all monumental architecture and churches, by any means, just as the ‘Classical’ Roman world wasn’t all monumental architecture and temples. 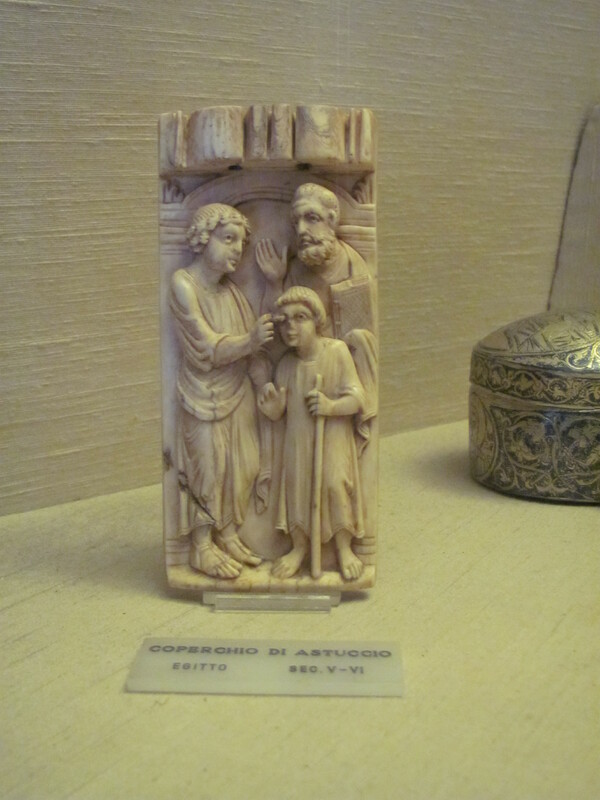 A great many Late Antique items of smaller stature are on display in Rome’s museums, especially if we take our starting date for the period that used elsewhere on this blog, of 235-641. 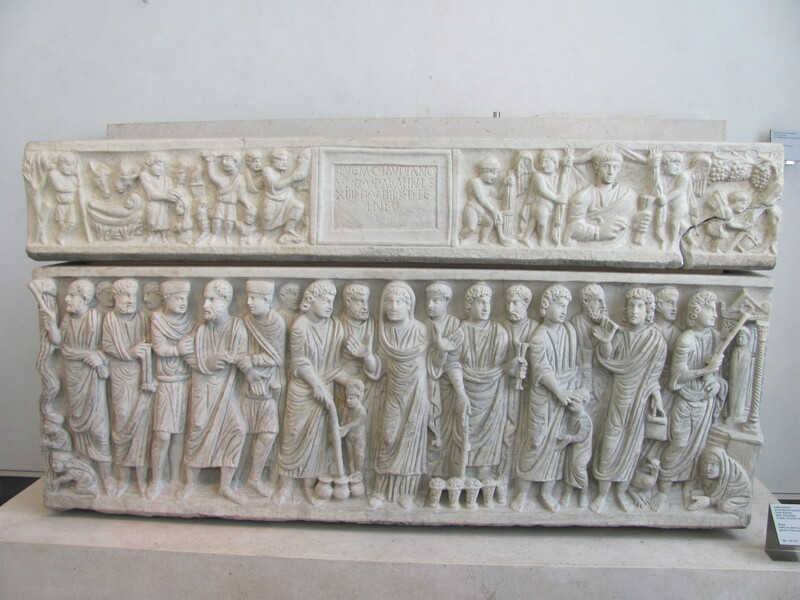 This is a sarcophagus of ca AD 270 with a bunch of togate fellows who, according to Palazzo Massimo’s display label, are involved in a consular procession. 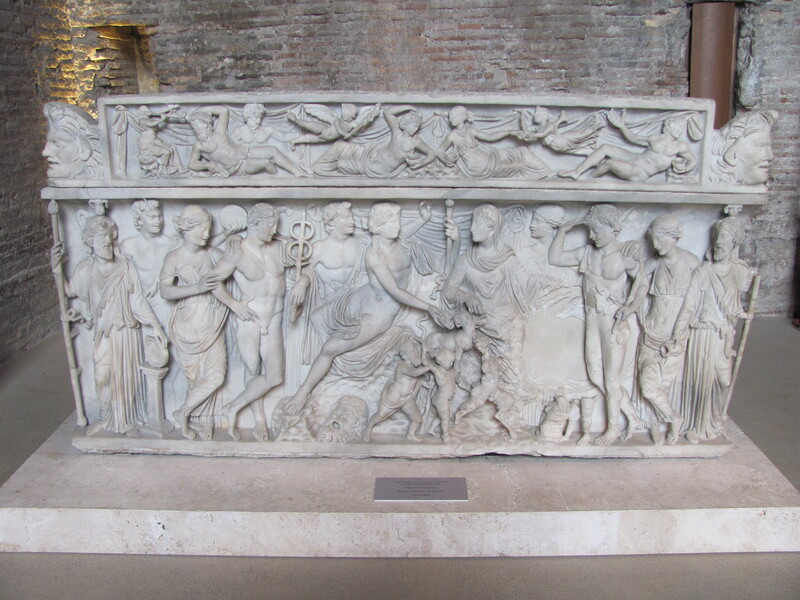 It is of larger scale than most second-century sarcophagi, but that has more to do with the wealth of the owner than the period of production. 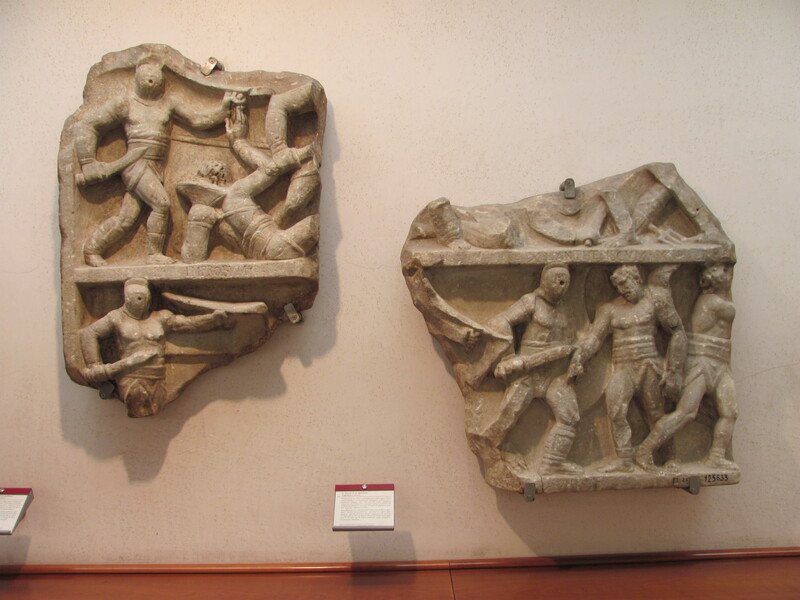 The figures here are cared in very high relief, almost as statues in the round. 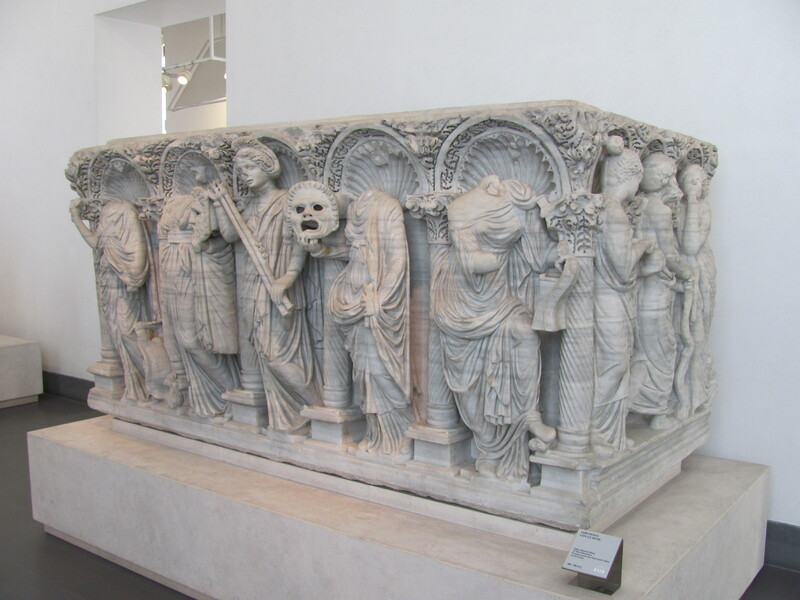 I love this sarcophagus because it has such great images of togas, that most Roman of garments. Here we see the growing trend that had already begun in some of the imperial art of the late second century of more front figures who are divided from each other in their own wee alcoves (on this, see Imperial Rome and Christian Triumph). 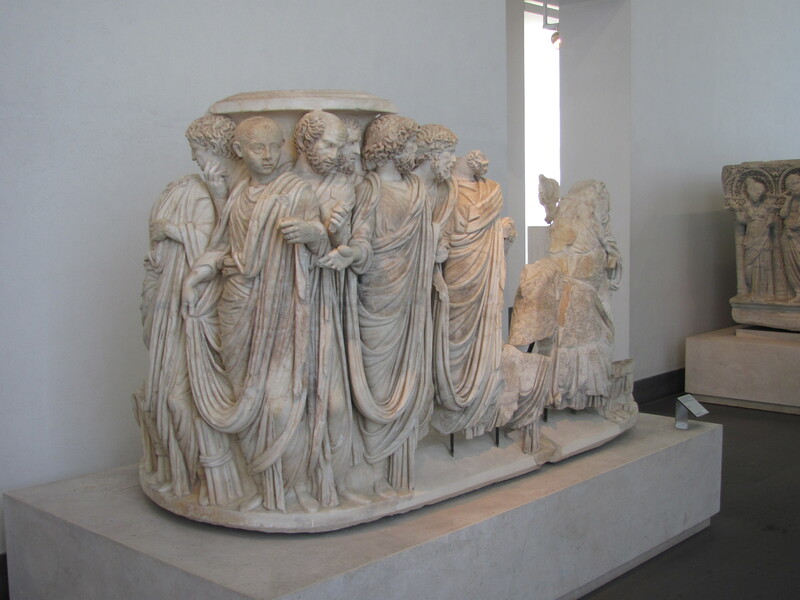 These are the Muses, those most classical icons of world culture. 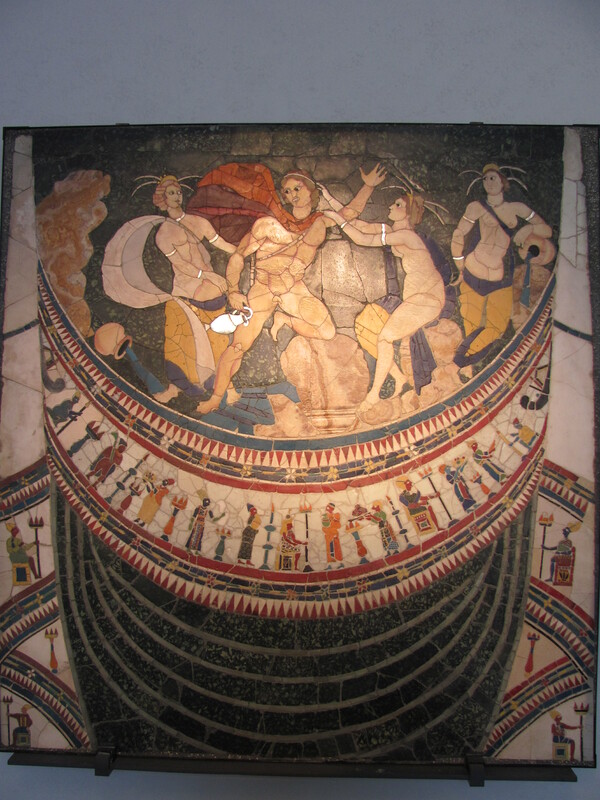 Opus Sectile has a very simple appearance that is quite disarming. It has its charm, though. 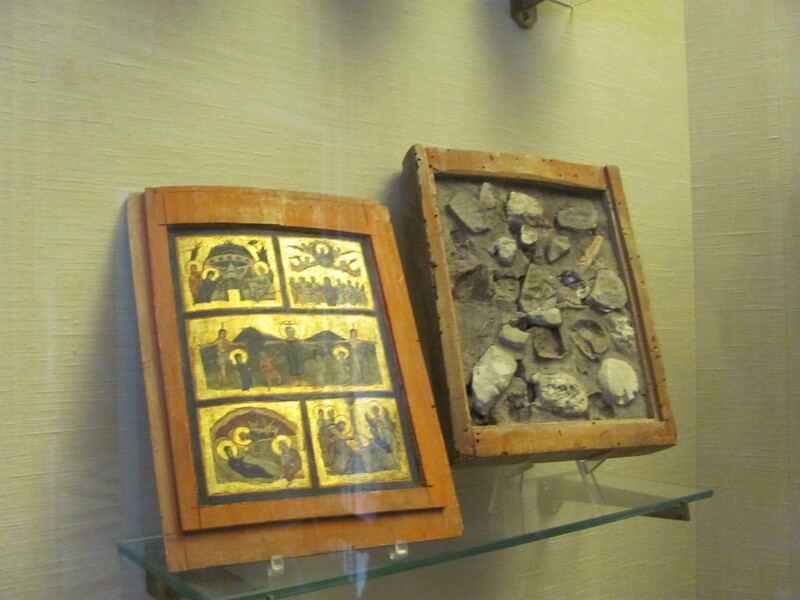 I don’t wish to burden you with too much more of this sort of thing, so I will simply close with two images from the Vatican Museum of some Christian items that herald to us the start of a new era, as the Classical recedes and the Mediaeval approaches. Anyway, as you can imagine, Late Antique Rome is not as hidden as I originally thought. You just have to know what to look for and where. 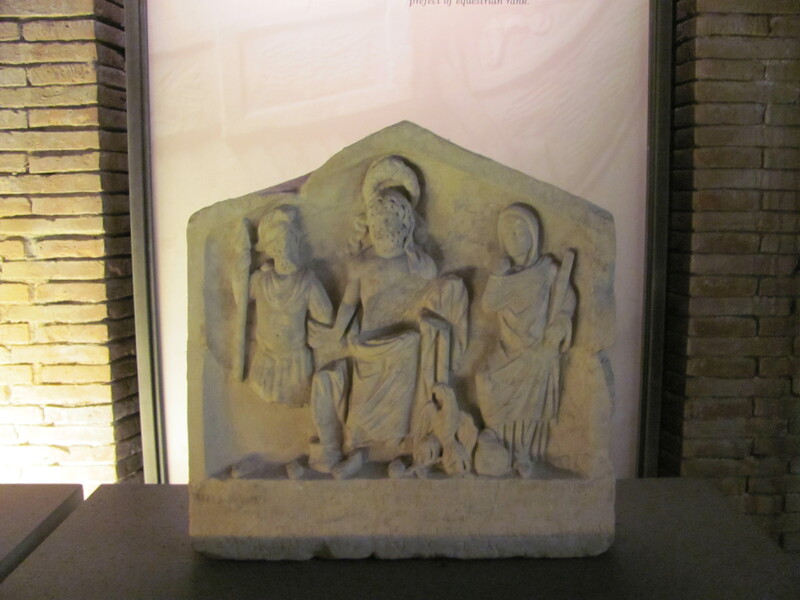 All sorts of Late Antique objects are in Rome’s museums, reminding us of the continuous history of the City as a centre of culture and human experience. 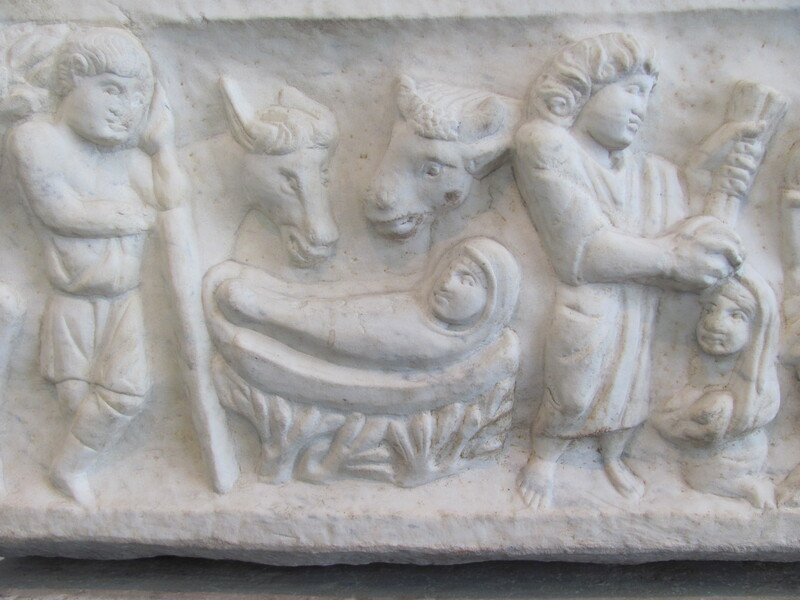 This entry was posted in Ancient World, Art, Christianity, Classics, Discover Late Antiquity, History, My Travels and tagged constantine, late antique art, late antique rome, late antiquity, opus sectile, paleochristian art, roman museums, sarcophagi, symmachus on October 25, 2015 by MJH. When I was in the gift shop of the Capitoline Museums, there was this American (presumably from USA?) guy trying to get the cashier – who was on the phone – to answer a query of his. His question was about the Capitoline She-Wolf. 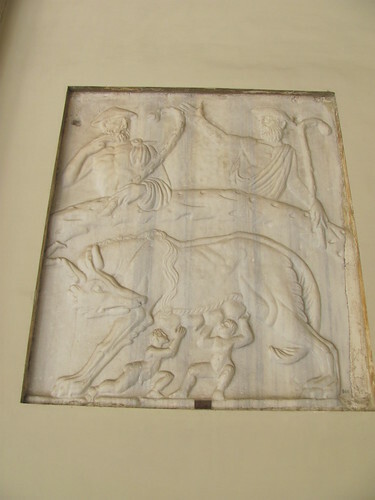 So I spoke up and explained to him the story of Romulus and Remus, gesturing to a magnet with said She-Wolf, saying that they were twin brothers conceived by Mars, and their uncle buried their mother, a Vestal Virgin, alive, while setting the babies adrift in the Tiber. They were saved by a She-Wolf who suckled them, and Romulus went on to found Rome. I’m pretty sure I left the fratricide out of the picture. His first question was about a three-headed dog. I said that his name was Fluffy – jk, I said that that’s Cerberus, the guard-dog to Hell, and that one time Hercules beat Cerberus up and brought him to the upper world. His next question was if Constantine was the one who ruined the Roman Empire. I said that, no, most scholars are agreed that the Fall of the (Western) Roman Empire Is Not Constantine’s Fault. I said that, in fact, the Empire was very strong for most of the fourth century after Constantine’s reign, since many of his reforms and those of his predecessor, Diocletian, helped bring stability. I said that it wasn’t until a century later, in the mid-400s, that things started falling apart. His third question was about the images of Jesus being crucified that he’s seen, and he wanted to know why in a lot of them there is a wound in Jesus’ side. So I explained that that’s because the soldiers were going around to break the legs of the people being crucified to make them die faster, but found Jesus apparently already dead. So they stabbed him in the side to be sure, and the wound bled what appeared to be blood and water – which, I said, is actually the plasma separating from the rest of the blood upon death so that it runs clear but everything else looks ‘normal’ — thus, blood and ‘water’. He thanked me and asked if there was a book I could recommend or a TV show or something so he could learn about this stuff. And, you know me, I spend time thinking about stuff to recommend people so they can get into Classics, stuff that is both readable and accurate. And no books came to mind. Thankfully, I remembered Mary Beard’s documentary Meet the Romans (that I received for my birthday on DVD just before coming to Italy! ), so he took its name and hers down on his phone. I told him that Mary Beard is good because she writes stuff that normal people could/would actually read. My fellow museum-goer left, and I went to browse the books, where I found one of the books I’ve recommended on this blog in the past, The Penguin Historical Atlas of Ancient Rome. But it was too late. At least he had Prof Beard to guide him on his way! Then I got to thinking – I liked that! I mean, one of the reasons I want to be a professor of Classics is to teach people about Romans and Latin and ancient literature and even ancient art (if I ever feel qualified for that last one!). I really like the Classical world, and I want to see other people become interested, too. I don’t want to keep my knowledge to myself, but share it with other people. And those people needn’t always be undergrads, right? Fact is, the academic job market is not super-great right now. Obviously, university lecturing would be my first choice of job. Failing that, I’d be interested in teaching Latin/Classics at a private school somewhere (I’m not qualified to teach in the government-run schools, having done no teacher’s college). 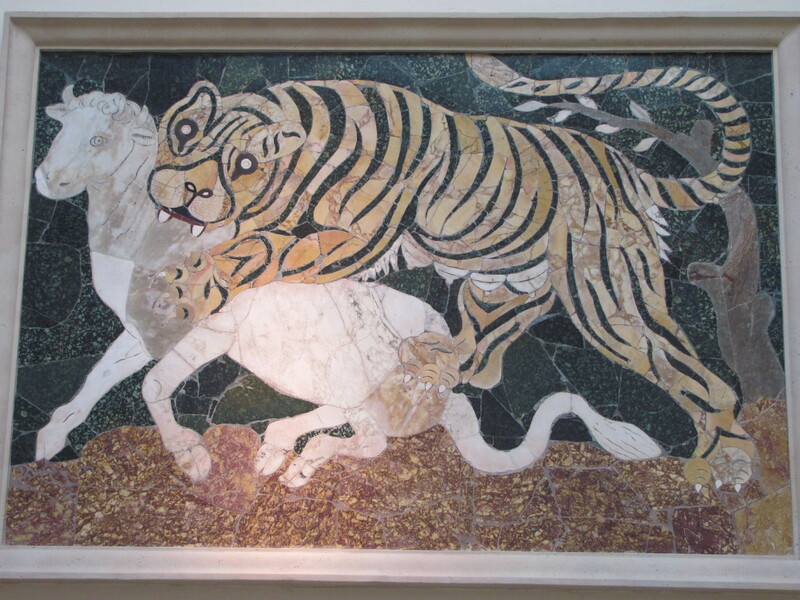 Third option, as of my trip to the Capitoline Museums? Seriously. It’s fun when the subject matter is interesting, you know what you’re talking about, and the people are both engaging and engaged with the subject matter. I always enjoyed giving tours to keen groups at Fort William Historical Park, after all. Mind you, they were mostly children, but not always. I would not be one of those people standing around near museums and attractions trying to round up randoms off the street, though. I would apply to work for those tour companies that are pre-booked, preferably the ones targeted to people with an interest in history (I see their ads in every issue of BBC History or History Today). I think it would be fun to teach normal people about ancient things surrounded by ancient things! It would be exhilarating! It would be interesting. I’m sure many days it would be dull, and many tourists would be frustrating. But overall, the academic historical tour guide is not necessary a bad job. 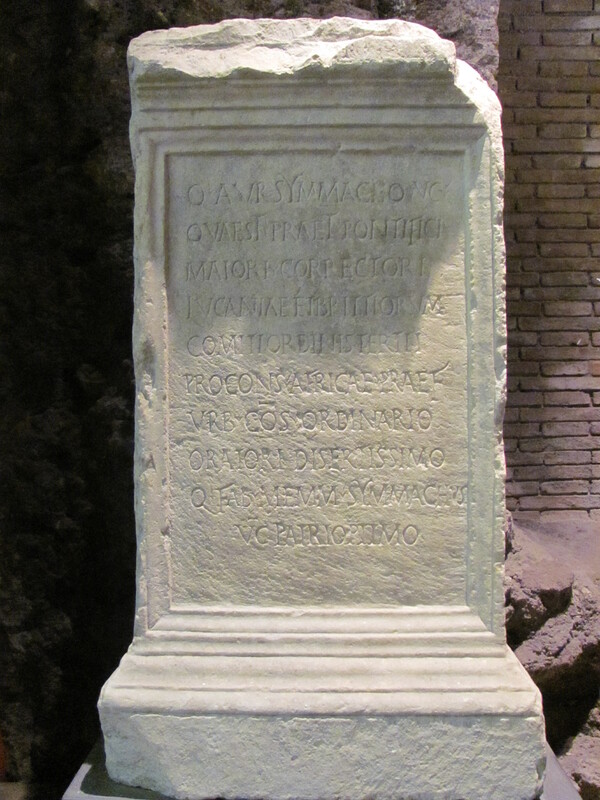 This entry was posted in Ancient World, Art, Books, Christianity, Classics, History, My Travels, Mythology and tagged capitoline museums, capitoline she-wolf, cerberus, constantine, jesus' wound in side, mary beard, meet the romans, penguin historical atlas of ancient rome, romulus and remus, tour guide on June 10, 2014 by MJH. Now, what to say about the politics from Constantine to Honorius and Arcadius? (Since we already discussed Diocletian with the third century.) 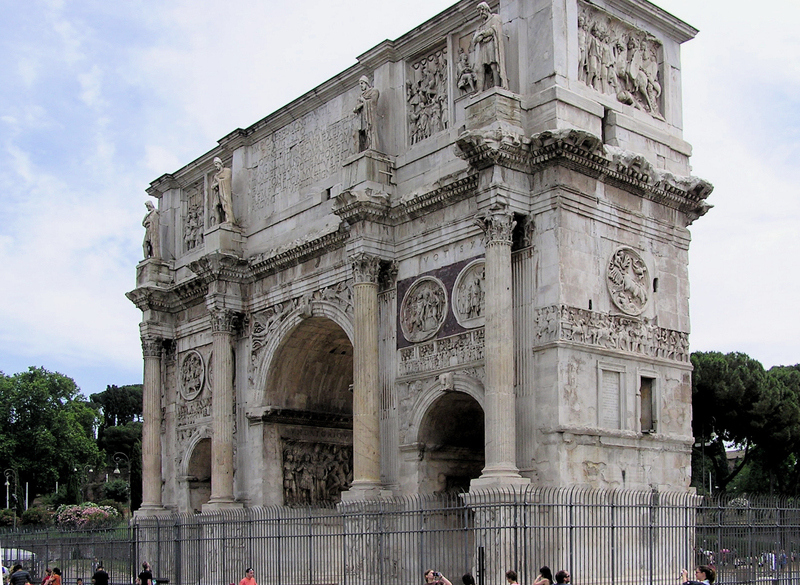 For the first portion of Constantine’s reign, there were civil wars until 312 when he defeated his western rival Maxentius at the Milvian Bridge (it was around this time that Constantine had his conversion to the god of the Christians), thus becoming sole emperor of the West. 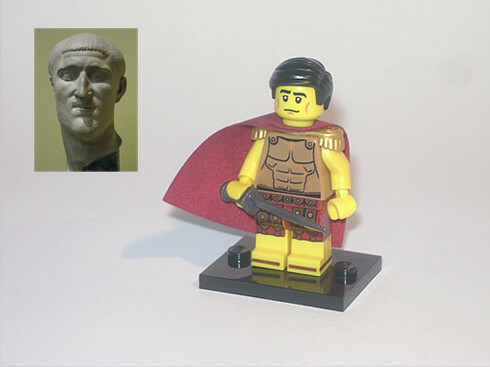 In 324, he defeated his eastern colleague Licinius (allegedly over persecution of Christians) and become sole emperor of the whole Roman world. Let us remember that the whole Roman world, the empire, at this time stretched from Britain to Spain and North Africa, across to Mesopotamia and down the Nile. There were Black Sea provinces. There was influence in Armenia. Despite the images people like to paint of Roman hegemony after the 200s, the recovery of Diocletian and Constantine meant that Rome maintained and stabilised her territorial possessions. 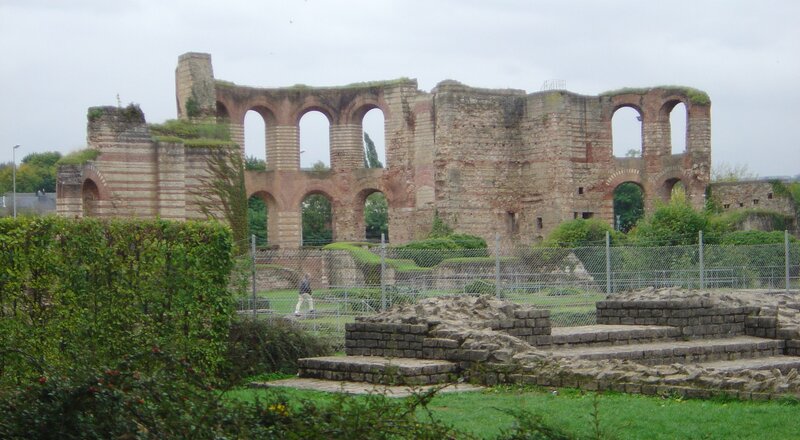 Constantine had spent much of his earlier career based in Trier on the Moselle (a river which immortalised by Ausonius in this poem). In 330, he rededicated Byzantium on the Bosporus in the East as Constantinople — destined to be the New Rome and a Christian capital. Upon his death in 337, there was a bit of a bloodbath (see R W Burgess, ‘The Summer of Blood’). His son Constans ruled from the West until 350, and Constantius II ruled the East, then the whole thing, until 361. Constantius, as you learn in Ammianus, had a few bloodthirsty caesars co-rule with him. He was succeeded by the ‘pagan’ Julian the Apostate (would have called himself a Hellene), himself an orator, poet, and philosopher, who did to the Christians what Constantine and Constantius had done to the Graeco-Roman polytheists. 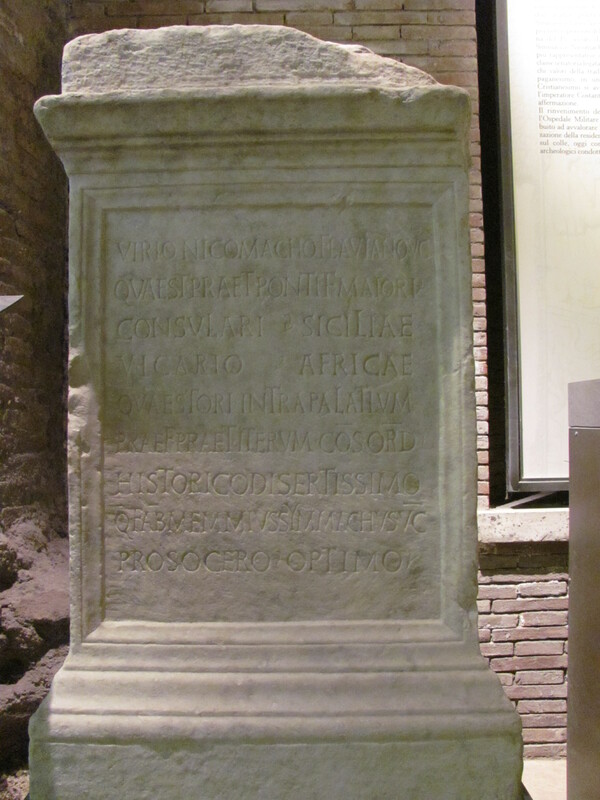 He died on campaign against Persia in 363 (see my post on Julian in Ammianus). Then came Jovian, hailed by the army in Persia. He lasted nary a year and was succeeded by Valentinian I (r. 364-375) who elevated his brother Valens as co-emperor (r. 364-378). 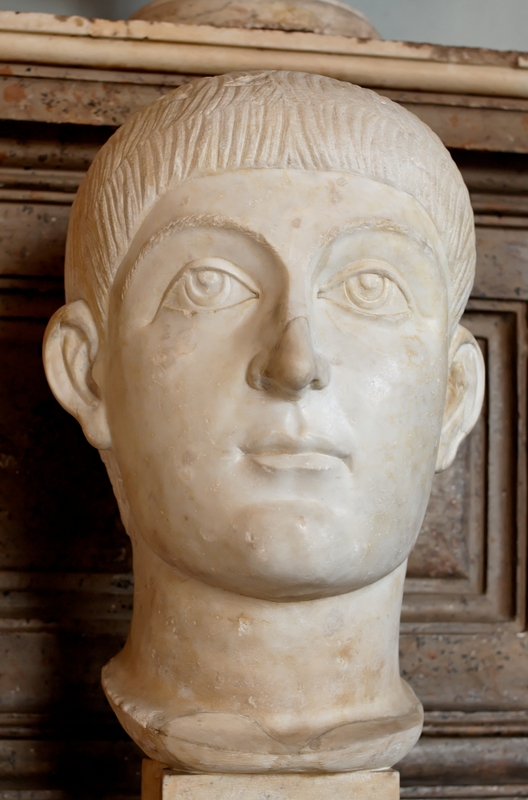 Valentinian’s son Gratian (d. 383) was elevated in 367 and Valentinian II (d. 392) upon Valentinian I’s death in 375. 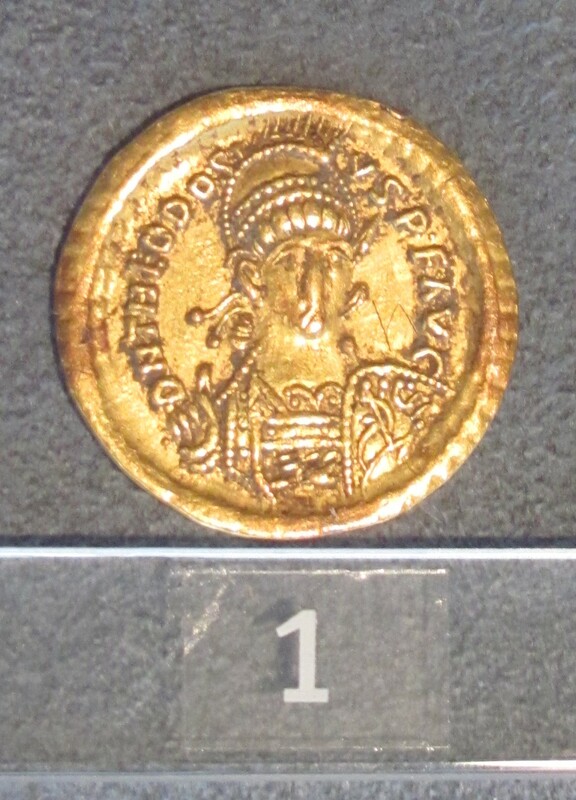 378-395 saw the reign of Theodosius I ‘the Great’. Upon Theodosius’ death, the empire was finally and enduringly split between East and West, his son Honorius taking the West (r. 393-423) and his other son Arcadius the East (r. 395-408). Those, in brief, are the emperors of the fourth century. If this isn’t Valens, it’s Honorius. Throughout these reigns there was ongoing warfare and military posting along the Rhine. As well, Goths were interested in crossing the Danube. They were settled on Roman territory in 376, but, rather than treat them well and integrate them into society, relations between the Romans and Goths deteriorated to the point where the Goths decided it was in their best interests first to plunder, and then to engage the Romans in battle. The most famous of these battles was near Adrianople in Thrace (Edirne, modern European Turkey, near Greece & Bulgaria) in 378, where the Emperor Valens was slain. War with Persia was also intermittent. As I mentioned in the post about the third century, Persia had re-emerged as a major power in the East under the Sassanian dynasty, taking the Emperor Valerian captive in 260. Despite a treaty made in 363 after Julian’s disastrous campaign, the Persians found pretext to invade Rome, claiming the Romans had violated the treaty. Before I start sounding like a Roman talking of ‘typical’ Persian ‘duplicity’, I can well imagine the Romans having broken the treaty if it had been in their interest and they had had a pretext. Theodosius I and Shapur III signed a peace treaty in 384 that would last until 421. It wouldn’t be the Roman Empire without a few usurpers, either, though. The most famous of these is Magnus Maximus, a Spanish general posted in Britain who rebelled against the Emperor Gratian in 383. (Sorry that he’s not actually British.) In 384, Theodosius I agreed to give him command of Britain. However, in 387 he wanted more than he already had, so he invaded Italy. 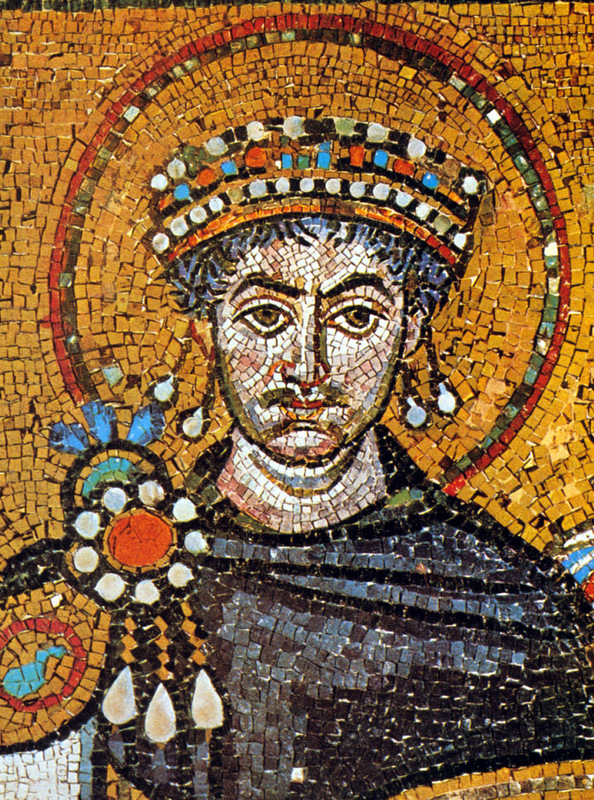 In 388, Theodosius defeated him at the Battle of the Save. I would say that Maximus was more tolerated than fully integrated into the imperial system. Northern Gaul was often a troublesome place, and local aristocrats had previously, and would again in the future, taken the power of command into their own hands. I feel that this has been far too cursory a treatment of fourth-century politics, but I also don’t want to go on too much. My apologies for this. I hope, however, when combined with the prior post on religion and literature and the upcoming post on art, it will help give you a feel for the fourth century and the people who inhabited it. This entry was posted in Ancient World, Books, Classics, Discover Late Antiquity, History and tagged ausonius, constantine, fourth-century politics, fourth-century rome, late antiquity, magnus maximus, mosella, r w burgess, summer of blood, theodosius i on February 24, 2014 by MJH.